Send important Transactional SMS to your clients fast, with our Special route. Send messages directly to whatsapp user in one click, get in touch for info. Get free APIs with every account easy to integrate and blazing fast. Send bulk voice SMS to your clients to blast important messages to clientele. Get in touch with our staff to know more about our other services. 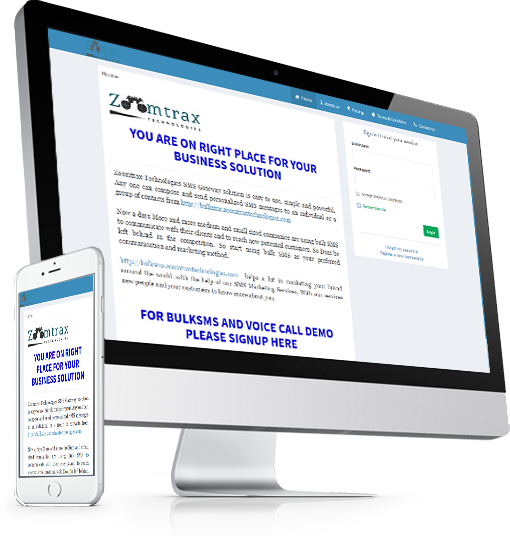 Zoomtrax Technologies Email marketing facilitates easy reach to target mass in a place they visit on regular basis – their INBOX. At Zoomtrax Technologies, we offer exponentially better assistance to augment user engagement and harvest desired result. VALUE Email campaign is a targeted, shareable, credible, measurable, and cost-effective tool. REACH Email marketing service allow brands to meet prospects in their choice of environment. BESPOKEEmail advertising service makes it simple to tailor-made your message for each customer, fostering a higher conversion rate. ​EFFECTIVENESSAs per Direct Marketing Association, email marketing is 40X more effective than any social media platform in acquiring new business. ​TRACKABILITYEmail marketing campaign are easy to track and ROI is measurable. Run your campaign with peace of mind, your data is safe with 148bit encryption. Your SMS are always delivered super fast, with our proprietary Roundsms technology. Your Campaign data is stored for up to 3 months, download reports with one click. Our simple and intuitive dashboard allows you send SMS quickly with less effort. Bulk Messaging is the dissemination of large numbers of SMS for delivery to mobile phone terminals. It is used by media companies, enterprises, banks (for marketing and fraud control) and consumer brands for a variety of purposes including entertainment, enterprise and mobile marketing. Email marketing is a way to reach consumers directly via electronic mail. Unlike spam, direct email marketing reaches those interested in your business’ area of expertise. Voice SMS/CALL is a technology that automates bulk voice calls to mobile/telephone users and playing pre-recorded messages. It's an inexpensive way to be in touch with your friends and family and even a safe way to send the message.